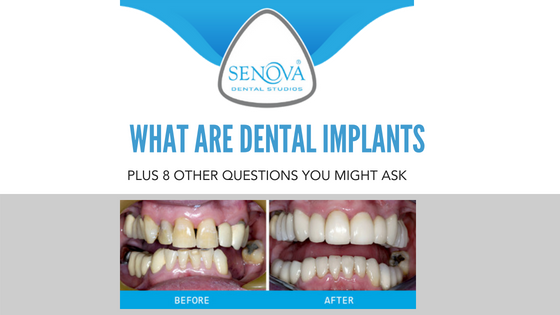 As more and more people consider their options to replace missing teeth and opt for dental implants we are finding that the questions relating to this treatment are becoming more and more common. This article takes a look through some of the common questions and gives an in-depth answer. Dental implants are a titanium replacement for a lost tooth. The essentially replace the root of your tooth by fixing into the bone around where the tooth has been lost. Ideally dental implants are replaced immediately the tooth has been removed, this is less traumatic for the bone and means the dental implant can support the bone and prevent bone loss due to bone resorption. Generally speaking dental implants should not be painful although there will be mild to moderate discomfort after the procedure. Your dentist will always ensure that you are fully anaesthetised around the area in which the dental implant will be placed. Many dentists also offer dental sedation which can help you relax during treatment. Don’t be afraid to mention this to your dentist if you would like to have sedation for your implants. After the dental implant has been fitted you may feel mild to moderate pain as the nerves return to normal after the anaesthetic. Over-the-counter painkillers will help to keep the pain at bay. Any pain should only last for a day or so will begin to subside once the swelling goes down. If you have anything more than moderate pain or the pain lasts for more than a couple of days after having dental implants then it is advisable to see your dentist for a quick checkup. The simple answer to this is, it depends. If the dental implant was left alone with no impact from the adjacent teeth then it would last for ever… But this isn’t the real world! Dental implants are in a rather hostile environment, your teeth are capable of exerting immense force on each other and this puts the dental implant under a huge amount of pressure each time you bite. However, The dental crown on top of the dental implant will typically last approximately 10 years, however with good care and maintenance a crown on top of the dental implant could easily last 15 years or longer. There are no real side-effects from dental implants. The titanium used is completely inert and integrates into highly with the body, making it a highly biocompatible material. Any side-effects felt are usually from the surgical aspect rather than the implant itself. Side-effects from the surgery can include mild to moderate pain, swelling and bruising… This will usually subside within a few days. The only other side-effect from dental implants is that you can now eat, smile and chew again with confidence… A rather good side-effect we think! The dental implant itself cannot be removed in normal everyday use. If you have a denture which clips over the top of the dental implant then this can be removed. Dental bridges which screw onto the dental implant can be removed by the dentist but not the patient. If there is a clinical reason for the dental implant itself to be removed this can be done but will be done only as a last resort if there is no other way to save the implant. When the dental implant is placed it will be gently turned and screwed into the hole that has been prepared for it. This provides a primary mechanism for stability. The human body is also not able to detect the titanium oxide layer on the outside of the implant as a foreign object, the bone will actually integrate with the implant itself. This provides secondary stability and ensures the dental implant cannot fall out. The dental implant itself. Failure at this level would typically be where it has failed to integrate into the bone. The most likely cause is infection. The screw connecting the dental implant (The part you don’t see) to the restoration on top (The part you do see). Modern dental implant design means this happens extremely rarely nowadays. The restoration on top of the dental implant (the part you see). This is the most likely cause of failure, it can be caused by chipping or breaking of the restoration. The good news is that the restoration can usually be removed (if it has been screwed in) and then either replaced or repaired without affecting the dental implant underneath. Moderate to severe pain around the area of the dental implant. This would indicate that the integration into the bone is beginning to fail or that there is infection in this area, you should seek dental advice as soon as possible. The restoration over the implant becoming loose. You may notice that the restoration, if it is screw retained, has become loose. This is not a dental emergency but you should see your dentist as soon as possible in case the restoration comes out completely. Dental implant costs vary considerably depending on what is required. If the implant is complex and includes things like bone grafting then the cost will be considerably higher. You can expect a typical implant consultation with an oral surgeon to be around £112. Placement of the dental implant can be from around £1300 with the final restoration on top from £1300. Whenever you have a dental implant you should always ensure you have a full treatment plan from the dentist before you begin, this ensures you know exactly what the process is and what the cost is going to be, before you go ahead.